THE NORWEGIAN GOVERNMENT is to release a report today on the response to the killing of 77 people last summer in two attacks. The first attack, a car bomb in downtown Oslo, killed eight people. In the following hours, a further 69 people were killed in a mass shooting on the nearby island of Utoya during a Labour Party youth camp. Anders Behring Breivik, 33, has admitted planning and carrying out both attacks, but has denied criminal responsibility. He claimed the attack victims were traitors for embracing multiculturalism in Norway. A Norwegian court is due to deliver its ruling on the case later this month. 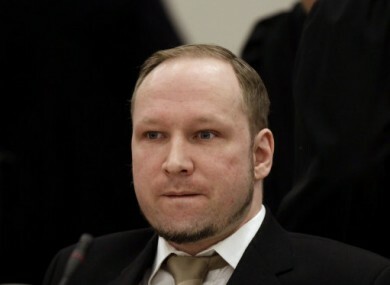 If found sane, Breivik could face 21 years in prison or an alternative custodial arrangement under which he would be detained until deemed no longer a threat to society. If found insane, he faces indefinite committal to a psychiatric institution. An official report to be published this afternoon will focus on how it was possible for so many people to be killed in last year’s attacks. VG Nett reports that the chairman of the commission inquiring into the response to the 22 July 2011 attacks has indicated that the report will by highly critical of that response. Commission chair Alexandra Bech Gjørv said that the report would detail six main findings along with dozens of further recommendations. Email “Norway to publish report on response to 22 July attacks ”. Feedback on “Norway to publish report on response to 22 July attacks ”.